Hi, I am trying to make a front panel with a brocade fabric. The panel is 9" wide and will be on the front and back of the vestment. 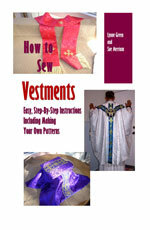 My problem is how can I give the brocade some stability so it will not pucker after I apply it to the vestment? I am using light tension , a walking foot. I am almost ready to give up. Try using iron-on interfacing. That should give the brocade more body and keep it from puckering.